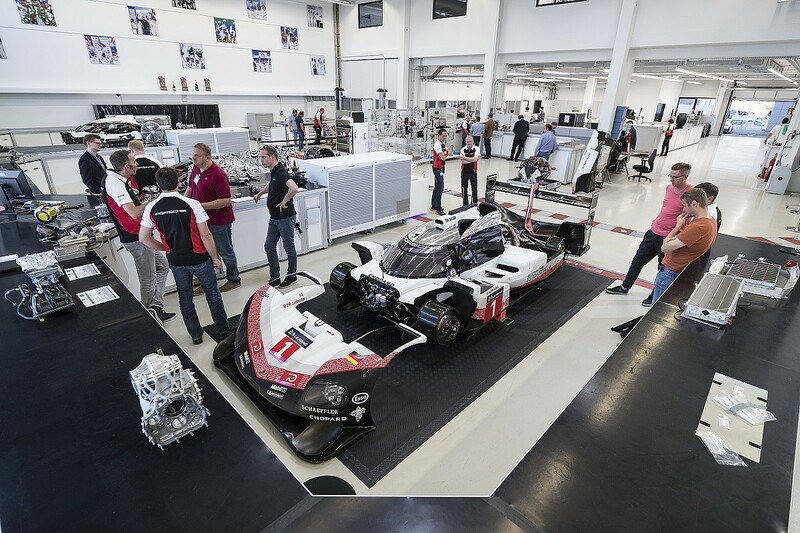 The Porsche 919 Hybrid Evo's clear visual differences from its World Endurance Championship LMP1 challenger origins suggest an undertaking that began with a blank piece of paper. Instead, the finance men and logic won out over white-knuckle record chasing. After all, why should Porsche commit boatloads of cash to a programme it ended when it withdrew from the WEC following the 2017 season? That decision followed the dieselgate scandal and the realisation of its Formula E ambitions. That electric switch has been bolstered by the Evo, with Andreas Seidl, the Formula 1-bound head of Porsche's LMP1 programme, explaining that it will have carryover into its FE programme. It stems from a car that was not radically different from its predecessor, specifically, the #1 Porsche 919 Hybrid that Neel Jani, Nick Tandy and Andre Lotterer raced at the 2017 Le Mans 24 Hours, which looked set for victory until the 21st hour when a lack of oil pressure brought it to a halt. The developments that made the original 919 Hybrid the class of the WEC's LMP1 field started with the internal combustion engine that was augmented with two energy recovery systems. The first was a conventional MGU-K situated on the front axle, collecting any lost energy expended under braking and storing it in a mid-mounted lithium-ion battery. 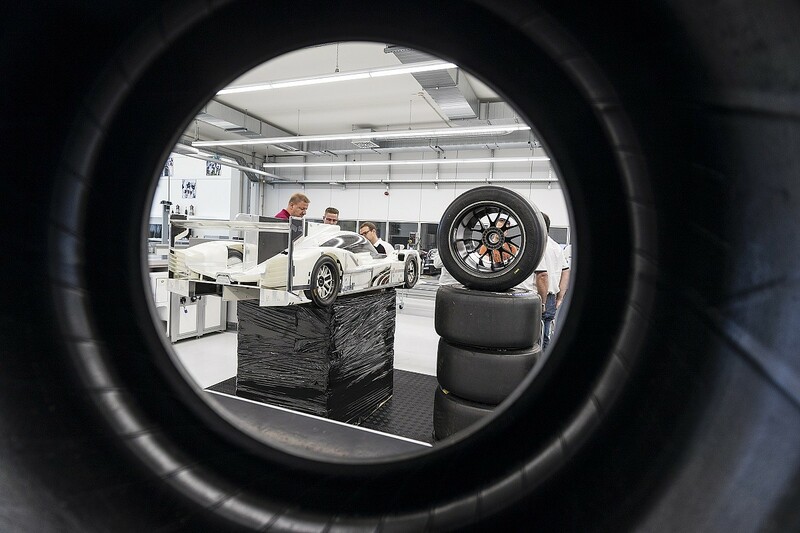 Initially able to hold up to 6MJ of energy at the 919 Hybrid's 2014 debut to power the front wheels, the system created an all-wheel drive concept when activated. Instead of aping rival Toyota with a second, rear-mounted MGU-K, Porsche pursued an innovative solution for its second energy recovery device. In addition to the turbo, an extra turbine was included within the exhaust system to salvage further energy from the discarded gases, packing the battery further with recovered energy. With the engineers determined to make the system also work at low speeds, variable geometry ensured that it could adapt to the flow of exhaust gases available. Porsche had opted for an 800V battery in the pursuit of further efficiency when powering the hybrid drive system. Although the benefits were obvious, delivering more power through reduced heat loss as a result of reduced current, it meant that Porsche had to break new ground with its battery technology - delving into levels of voltage never before explored in motorsport. The Evo was repeatedly described as an "engineer's dream come true", but that it did not "fully exploit the technical potential"
Partnering with lithium-ion battery expert A123 Systems, Porsche was able to put together the battery package it desired, complete with the energy density required to charge and deliver the extra 400bhp boost on offer. The V4 engine was also designed to be as powerful and efficient as possible, pumping out over 500bhp on its own while boasting an efficiency figures of 40%. As Porsche geared up for its first 919 Hybrid test, the car was unable to contain itself; as soon as the clutch engaged, the vibrations immediately broke the link between the engine and gearbox. Although the Weissach engineers worked on the issue, the vibrations remained and left the drivers feeling dizzy and nauseous after driving the car. That was enough to convince Porsche to return to the drawing board and redesign a hefty chunk of the engine. Thankfully, things got better. The 2014 season was a learning campaign, giving the Porsche engineers plenty of areas to improve ahead of the squad's second year in the WEC despite ending the year with victory in Brazil, thanks to Romain Dumas, Neel Jani and Marc Lieb. There were plenty of changes as Porsche opted to move up to the bigger 8MJ battery class at the expense of a reduced fuel allowance. To accommodate this, the V4 engine was improved to produce more power, and the monocoque was also new, now moulded in one piece to save weight. With those revisions, Porsche's #19 car - driven by Tandy, Earl Bamber and Nico Hulkenberg - dominated the 2015 Le Mans 24 Hours, benefiting hugely from the greater amount of electrical energy available from the hybrid systems. 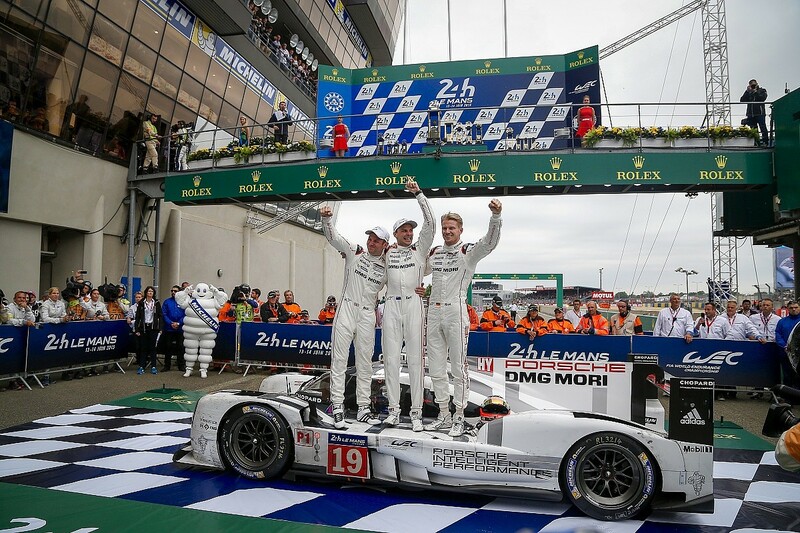 Buoyed by the Le Mans triumph, Porsche swept to victory in the rest of the 2015 races to beat Audi to the manufacturers' championship by a mammoth 80 points - Timo Bernhard, Mark Webber and Brendon Hartley triumphed in the drivers' standings thanks to a four-race victory streak. The evolution of the 2016 car was much less pronounced - the WEC had restricted the number of aero packages available to the LMP1 squads to three across the season. With compromises therefore needed, the customary Le Mans low-drag package meant that the remaining pair of kits had to cover off as many configurations of circuit as possible. Furthermore, allowable fuel use was cut by 0.4 litres per lap, placing a greater demand on the hybrid systems to fulfil the shortfall as the power output of the internal combustion engine was reduced with the fuel flow. Porsche set to work on improving the MGU-K device at the front axle to harvest more energy, and continued its battery development. After winning another series title, the 919 Hybrid went into its final WEC-legal iteration in 2017 - where the regulations only allowed two full aerodynamic configurations throughout the year. Reduced downforce to cut cornering speeds ensured that compromise was an even bigger factor. Adding in a greater amount of adjustability into the aero package, Porsche focused on reducing the sensitivity of the front end - where it had found performance suffered as the previous design had the propensity to accumulate tyre marbles. 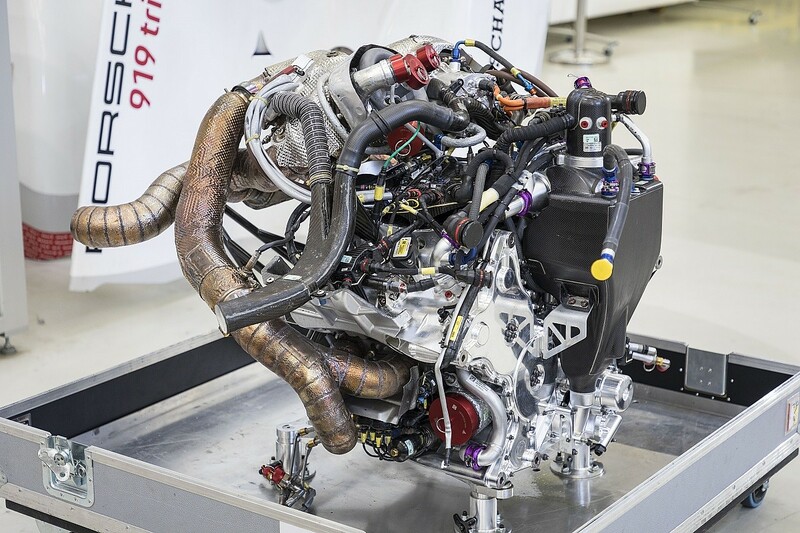 The internal combustion engine's architecture was further improved in pursuit of greater efficiency, pushing its overall performance back towards the 500bhp mark and overcoming another small reduction in allowable fuel flow to create a total system output of 900bhp, along with its hybrid systems. A strengthened challenge from Toyota gave Porsche a run for its money, but Porsche's greater hybrid systems advantage - and its eventual Le Mans victory following an early pit visit for repairs - resulted in a near-perfect swansong season. It bowed out at the end of 2017 by winning both drivers' and manufacturers' championships. No longer shackled by the restrictions involved in the WEC, Porsche's engineers then set to work on turning a three-time title winner into a lean, mean, record-breaking machine. For the record-breaking runs at Spa Francorchamps and the Nurburgring Nordschleife, Porsche began its Evo project by removing any elements that the upgraded car didn't need for a single lap run. Gone were the air conditioning, its lights, the windscreen wiper, several sensors, its pneumatic jack system and any electrical devices mandated by WEC's race control. In total, 39kg was lost to bring the weight down from 888kg to 849kg - including a driver. A side-by-side look at the 919 and the Evo suggests extensive changes were made, and in some respects that's a valid conclusion. Nevertheless, the most incredible bit of the record-breaker is the fact that a vast improvement in performance - the Evo lapped Spa 12 seconds quicker than the 2017 WEC car did in qualifying that year - largely came from finetuning existing elements. The Evo project's focus was on maximising existing elements such as the V4 engine to its peak performance and developing existing areas to withstand a more extreme level of power, downforce and grip. There were some elements of development, including pieces of planned work for a 2018 WEC car that never ended up existing, but it was hardly dramatic considering Porsche had not machined a large quantity of those planned updates. The Evo was repeatedly described as an "engineer's dream come true", but that it did not "fully exploit the technical potential". A small budget, topped up by Porsche's many sponsors and backers, and the short timeline of the Evo saw to that. But there was still time for some of the Evo's most important developments to be implemented. Porsche created three aerokits last year: high-downforce, Le Mans and the Evo. The Evo is by far the most dramatic, offering a 53% increase in downforce. Porsche's leading LMP1 aerodynamicist Matthew Jacquemont said: "[There were] very little elements from the [planned 2018 car] because even though it was in development we didn't have the parts." Free from aerodynamic regulations, Porsche extended the front diffuser and revised the turning vanes to increase front-end downforce, also reducing the ride height. The floor underwent minor changes, adding packers - helping the high-loads generated by increased downforce - and improving the cooling. Porsche also went to a pre-2017 specification by enlarging its rear diffuser and rear wing. The final addition was an active front diffuser and active rear wing, which allowed the Evo to run at full throttle in some of Spa and the Nordschleife's more difficult corners. Early teething problems with "aero-bouncing" at Spa - at its worst on the Kemmel straight - forced Porsche to tweak the car's downforce levels. The temptation for a record run after finding an ideal aero package would be to find the limits of the engine, but costly development meant Porsche barely touched its "powerful midget" V4. Instead, Porsche found additional power by upping the fuel-flow rate by around 35% - to 3.3264-litres per lap from the 2.464-litres mandated in the 2017 WEC season - meaning its power output went up to 720bhp from its standard 550bhp. Porsche engineers told Autosport it was the "maximum" the car could handle in its revised design. Esso also provided a special oil to help improve the cooling the Evo demanded, which aided the performance of the seven cooling units for components such as the engine, engine oil, intercooler, the electric motor and the battery. The revised power output and aerodynamics had a knock-on effect to the 919 Evo, meaning Porsche had to revise elements such as its suspension. While not ideal for performance, adding weight and making the car more rigid, it was ultimately necessary. The Evo's aero loads reached as high as 6G, a rise of 25% on the 2017 racecar. To counteract that g-force, Porsche reinforced the links between the steering and the wheels, with more resilient springs required. More dramatically, the lower wishbone needed significant strengthening as some of the Evo's brackets required a redesign. While Spa's demands were extreme, the Nordschleife was an altogether different challenge. Measuring equipment used to help Porsche at some of the WEC circuits' trickiest corners, such as the Porsche Curves at Le Mans and the fast section at Shanghai, was used to find the right settings for suspension loads in the record runs. Porsche's close relationship with Michelin and the French company's admiration regarding the manufacturer's record attempts meant it was more than willing to develop a new range of tyres specifically for the record runs. Michelin had to create a tyre that matched the altered suspension and extreme downforce aerokit of the 919 Evo. Its final compound's performance was enhanced by 15% compared to the 2017 WEC compound. Michelin shies away from the term "qualifying tyre" as it ran at a much higher pressures to increase the contact patch and to help safety. Jani believes that if Porsche was to revive the Evo, it would be able to run lower tyre pressures and find significant lap time improvement. Once Porsche had added all these elements, it was into the hands of the drivers to find the ultimate lap time. One of the key aids on the record runs was in the revised software overseen by expert Jens Maurer. Being free from the WEC's technical regulations allowed Maurer and Porsche to find an energy increase of 50% in the hybrid system, which Maurer believes was a "key part of lap times" in the record runs. 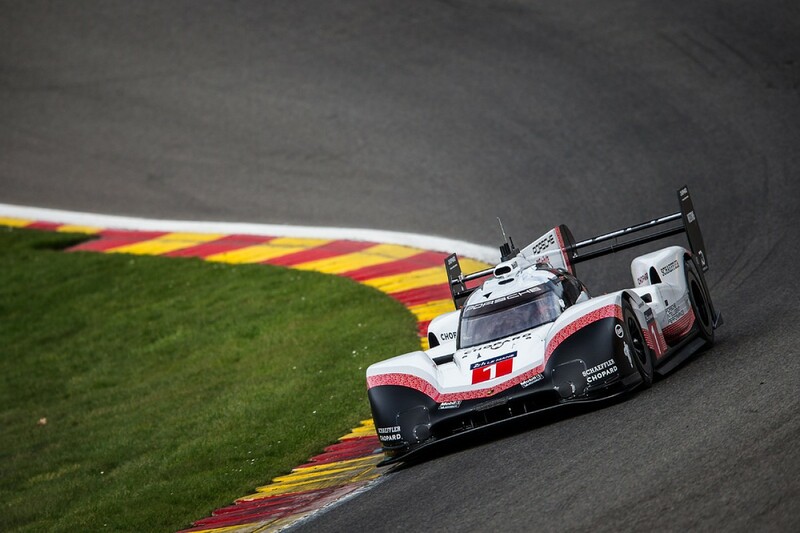 That hybrid efficiency allowed the 919 Hybrid Evo's total power output to rise from 6.37MJ of energy per lap for the WEC's qualifying at Spa in 2017, to 8.49MJ at the same track in 2018. Its final bhp was boosted by another 40bhp to reach an all-encompassing figure of 1160bhp. The software also included provisions for automated DRS activation at various points, critically avoiding DRS being deployed on any bumps that a track may have in its three or four uses per lap. Finally, a four-wheel brake-by-wire system was included, which meant a steep learning curve for the engineers, that gave the driver more control in yaw - helping reduce understeer and improve turn-in. 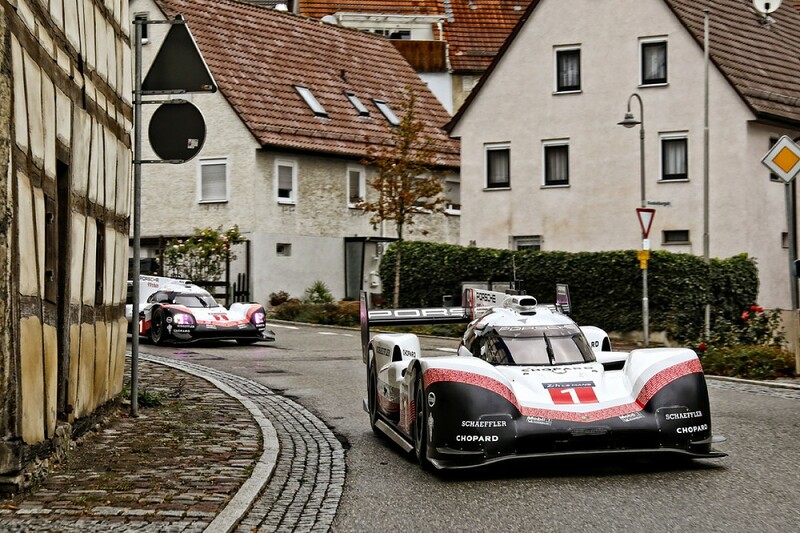 The 919 Evo might now be retired to Porsche's museum, following its outing on the public roads of Stuttgart, but that does not mean the technology advances made through the LMP1 car to the Evo were for nothing.